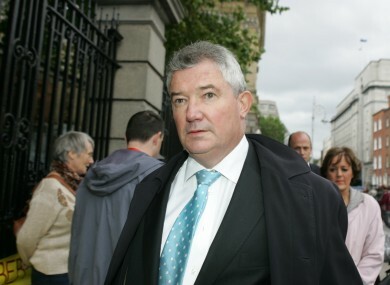 Bank of Ireland’s annual report shows Richie Boucher benefited by €831,000 last year after waiving €67,000 of pay. THE CHIEF EXECUTIVE of Bank of Ireland is still receiving pay far in excess of the government’s recommended limit for bankers – with new documents showing his total package with the bank was worth €898,000 last year. The bank’s annual report for 2011, published yesterday, shows that Richie Boucher’s basic pay stood at €690,000 for last year, and that even after waiving €67,000 of this, still received basic pay of €623,000 – significantly above the government’s €500,000 limit. The bank also contributed €174,000 to Boucher’s pension, and €34,000 in ‘other remuneration’ meaning a total package of €898,000, which becomes €831,000 after the €67,000 he waived. Another member of staff at the bank, former executive director John O’Donovan, was paid a basic wage of €550,000, but this was reduced to €495,000 – within the government’s limit – after O’Donovan waived €55,000. O’Donovan retired as an executive director on December 31. It is understood that because the government only holds a minority stake in Bank of Ireland, it was permitted to breach the pay ceiling by a certain amount, and that this is why Boucher waived a certain part of his wage. The government’s limit for pay only applies to bankers’ basic pay, and does not include pension arrangements, as part of a compromise intended to allow Irish banks to attract top executive talent. Bank of Ireland is the only native Irish bank not in majority ownership by the State; the government holds a 15.1 per cent stake in the bank after finding private investors to help reduce its own bill for bailing out the institution. Boucher’s wage was nonetheless attacked by Sinn Féin, whose public expenditure spokesperson Mary Lou McDonald described the “whopper salary” as “outrageous”. “It is absolutely scandalous that the head of a bank that has received such a huge injection of taxpayers’ money should be awarded this ‘pension cash allowance’, but what is even more scandalous is that this has been allowed to happen,” McDonald said. The report also confirmed previous figures showing that the bank’s losses for 2011 were €190m – down by 80 per cent from the €950m it lost in 2010. Email “Bank of Ireland chief executive given €898,000 package last year”. Feedback on “Bank of Ireland chief executive given €898,000 package last year”.